Founder and Director at higheredexperts.com, Karine Joly is a web marketing professional. 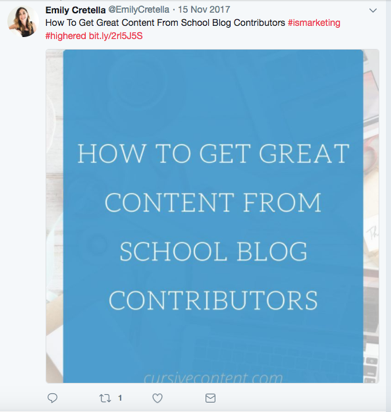 She has more than ten years of experience in content marketing and marketing strategy in higher education - and her Twitter feed reflects this. 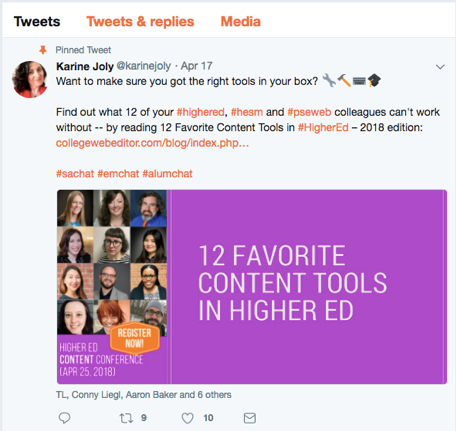 For example, Joly tweets her weekly newsletter, which covers best practices for analytics and branding in higher education. One of her most recent newsletters explains the benefits of using Instagram highlights on your higher education Instagram account. Joly is also a professor and teaches an eight-week online course on social media marketing for higher education. With her vast knowledge and expertise in higher ed marketing, she is a must-follow on Twitter! William Faust is a self-proclaimed higher education research and strategy nerd. Fraust has had a lifelong passion for brand strategy, messaging and story development. He is also a Senior Partner at Ologie, a branding and marketing agency that helps purpose-driven organizations discover their authentic story. 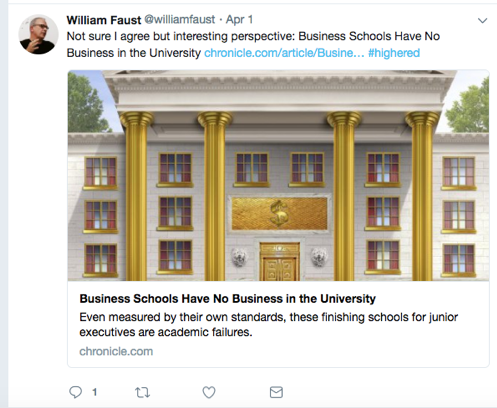 Although Ologie as a company is not focused on higher education, Faust is. His Twitter feed is full of posts about how colleges around the nation can appeal to students and build their brand online. Joshua Dodson knows higher education. As Bentley University’s Director of Digital Marketing, an AVP of digital marketing, a web analytics strategist, a co-founder and Chief Innovation Officer of a higher education marketing firm, and a professor, Joshua is clearly an authority on higher ed. Dodson has delivered more than 20 presentations, keynotes and workshops at national higher education marketing conferences and has taught more than 500 students as a higher ed expert. He fills his Twitter with links to valuable conferences, news in education and his own take on the higher education landscape. Rebecca Frost Davis is known for tweeting about digital humanities in the undergraduate curriculum and liberal arts colleges. Davis joined St. Edward’s University in 2013 as Director of Instructional and Emerging Technology, where she helps to develop an institutional vision with the use of technology in pursuit of the university educational mission. Her work helps to transform digital methods in teaching and research to advance the learning outcomes of universities. Davis’s Twitter feed is full of original articles, such as an overview of her thoughts on her recent visit to Endicott College. The higher education marketing world is fast-paced, constantly changing, and hard to keep up with. These higher ed professionals cover everything from the latest news articles to upcoming conferences on their Twitter feeds. With thousands of higher education marketers to follow on Twitter, these five are a great start to keep you updated on industry news and trends.